This luxuriously-gentle beta-hydroxy treatment mask is formulated to provide deep hydration and improved texture for a glowing, plump complexion. The result: skin that is glowing, hydrated and soft like a petal. The Petal's 28 active ingredients nourish your skin with active enzymes and replenishing nutrients, among which are the sophisticated blend of natural and organic essential oils known for their therapeutic properties, mineral-rich amazonian white clay known for it's skin toning and revitalizing abilities, and the low molecular weight hyaluronic acid known for it's ability to sink deep into the dermis to deliver intense hydration. 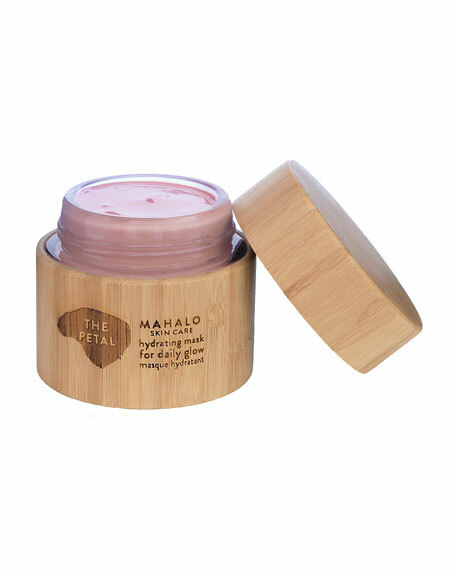 Bio-active Hawaiian and manuka honeys are prized for their therapeutic enzymes and unique antibacterial components that encourage instant rejuvenation and nurture skin cells in a potent, lasting way. The fusion of rose in it's many forms as a hydrosol, petals, essential oil and an absolute, offers one of the most complete experiences of this esteemed queen of flowers. The Petal is a thoroughly feminine skincare indulgence that is intended for daily use. Aroma: Sweet, floral, gentle and uplifting. Layered notes of rose, vanilla, jasmine and ylang ylang, rounded by a gentle and sweet honey aroma. Skin Type: ALL. Especially suitable for those concerned with signs of aging, acne, and dryness. Brightens, revitalizes and tones for an improved, smooth texture. Deeply hydrating for a plump, glowing appearance. Gently removes dead skin and stimulates cellular renewal. Manages problem-prone skin by clearing bacteria that cause inflammation. The Petal Mask has a uniquely soft, gel-like consistency, making it easy to apply with fingers or mask brush. The Petal Mask makes a wonderful morning treatment, applied 10-20 min before a shower, or as an evening treatment, like while taking a bath. Using clean spoon, scoop 1 teaspoon of mask onto palm of your hand, or treatment bowl*. Apply on clean skin, avoiding the eye and lip areas. For a daily exfoliation, allow to rest on skin for 3-5 minutes. For a more enriching treatment leave on skin for 15-25 mins, or if sensitive for up to 5 mins. To remove, use a wet warm face cloth, or wash-off under a warm shower. If the mask does not glide with ease over skin, it can be easily softened while in the bowl, or palm by mixing with a brush or your fingers for a few minutes prior to application. You might experience slightly reddish/flushed skin following 30-50 minutes after treatment, which indicates the desired boost in blood circulation. For in-store inquiries, use sku #2426864.